The crisis we face, Orr explains, is one of mind, perception, and values. It is, first and foremost, an educational challenge. The author begins by establishing the grounds for a debate about education and knowledge. He describes the problems of education from an ecological perspective, and challenges the "terrible simplifiers" who wish to substitute numbers for values. He follows with a presentation of principles for re-creating education in the broadest way possible, discussing topics such as biophilia, the disciplinary structure of knowledge, the architecture of educational buildings, and the idea of ecological intelligence. Orr concludes by presenting concrete proposals for reorganizing the curriculum to draw out our affinity for life. "What does one say about a book that is arguably one of the most important books written in recent years, perhaps ever?" 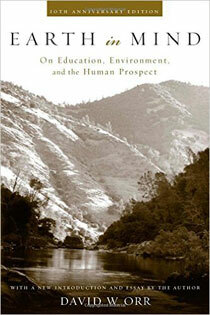 "Earth in Mind is a book for all who are committed to a restructuring of institutions of education." "As a rule economists understand economics, ecologists the environment, and educators teaching. David Orr is one of the rare authors who understands all three, and in these finely etched and admirable essays he delivers the revolutionary credo necessary, in my opinion, for the long-term survival of our species." "Justly removing the hide with the hair, David Orr here examines the calamitous 'success' of the industrial economy and of the educational system that subserves it....Earth in Mind is also a manual of ideas and possibilities for those who want to work toward a better end than the one now in view." Wendell Berry, author of "The Distant Land"
"David Orr is a seasoned doer as well as thinker, whose primary concern—education—could be the very pivot on which our society turns back toward life. If such dramatic and necessary change in our teaching and learning does begin, much will be owed to the ideas herein." Stephanie Mills, author of "Epicurean Simplicity"
Chapter 1. What Is Education For?